National Lifeguard has been Canada's standard for professional lifeguarding since 1964. Lifeguarding is an exciting and rewarding job that carries great responsibility. National Lifeguards train hard for events they hope will never happen and which they work hard to prevent. 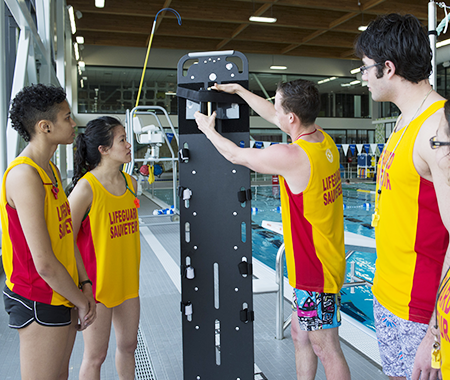 The Lifesaving Society, Canada's Lifeguarding Experts, certifies all of Canada's National Lifeguards. National Lifeguard is the professional standard for lifeguarding in Canada. National Lifeguards work at pools, waterfronts, waterparks, and surf environments all around Canada. They keep people safe through accident prevention, public education, and rescue response. National Lifeguards are always in training to keep their skills, knowledge and fitness sharp. They are required to keep certifications such as CPR and first aid up-to-date. Some are trained in advanced treatments like using oxygen or in the use of specialized equipment like defibrillators and personal watercraft. Most importantly, National Lifeguards save lives. Less than 2% of all drownings in Canada occurred in lifeguard-supervised settings. Becoming a National Lifeguard is a rewarding but challenging journey. Knowledge and skills learned in each course will carry over into the next to help you succeed. Courses like Bronze Medallion and Bronze Cross prepare you with water rescue skills, while Standard First Aid & CPR-C gives you the training to provide lifesaving measures to victims. There are four streams of National Lifeguard: Pool, Waterfront, Waterpark, and Surf. These streams ensure National Lifeguards from across Canada are prepared to lifeguard in their unique work environments. To take National Lifeguard Waterpark, you need to already hold your National Lifeguard Pool award. To take National Lifeguard Surf, you need to already hold your National Lifeguard Waterfront award. For more information and to begin the process of becoming a National Lifeguard, please visit the website of your local Lifesaving Society Branch. Watch the video above to hear real National Lifeguards talk about what it's like to be a lifeguard. National Lifeguard training develops a sound understanding of lifeguarding principles, good judgment, and a mature and responsible attitude towards the lifeguard's role. National Lifeguard training emphasizes prevention and effective rescue response in emergencies including first aid treatment. Candidates develop teamwork, leadership and communication skills. For more details about each award item, including fitness requirements, visit the At-a-Glance pages below. Curious About the Fitness Requirements? Watch the video above to learn about the fitness requirements in the National Lifeguard Pool award. National Lifeguard courses are offered at pools, waterfronts, waterparks, and surf environments throughout Canada. To find a course near you and for more details about the process of becoming a National Lifeguard, visit the website of your local Lifesaving Society Branch. 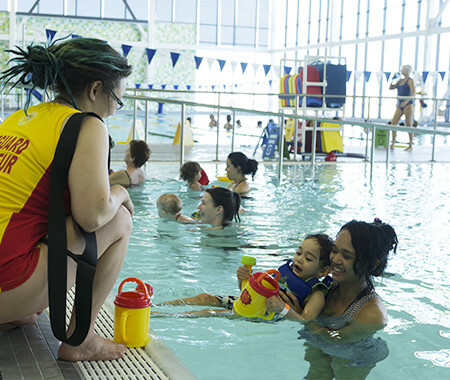 The Lifesaving Society - Canada's lifeguarding expert - is a full-service provider of programs, products and services designed to prevent drowning. We prevent drowning and water-related injury through our training programs, Water Smart® public education, aquatic safety management services, drowning research and lifesaving sport. For more information, contact our National Branch or your Local Branch.